La Día de los Muertos makeup and costumes are everywhere right now. Sugar skulls and their beautifully bright designs have taken over Instagram explore feeds and you’ll see at least one person sporting the ornate paint this Halloween, or a costume inspired by it. They are right, sugar skulls are absolutely beautiful but the reason why Latin America celebrates Día de los Muertos is even more beautiful, in our opinion. Día de los Muertos is a festival for the dead, or moreover to honour the dead. The festival’s beginnings originate from the combination of Aztec and Catholic faiths in Mexico and it takes place on the 1st and 2nd of November each year. The first day (today!) is often named la Día de los Angelitos or la Día de los Inocentes, a day to honour the souls of children. The second day is to honour the souls of adults, named Día de los Muertos. It is celebrated in Latin America and areas heavily populated by Latinx people. The festival dates back before the pre-Hispanic era, when the Nahua peoples (an indigenous people belonging to Mexico and El Salvador) would hold a month-long festival honouring the Aztec Lady of Death, Mictecacihuatl; she was the Goddess of the Underworld, and Keeper of Bones. By worshipping this skeleton deity, the Nahua people would be able to bring back the souls of their departed relatives. When the Spanish conquered Mexico between 1519 and 1521, they brought their Catholic religion with them so the month-long Aztec festival was moved to coincide with All Souls Day and All Saints Day in November. This is why the festival is only celebrated for two days today rather than the original month. You may think that this festival would be very upsetting and somewhat morbid but it’s exactly the opposite. As said by Catalina in the BBC Culture Documentary, festivities are similar to celebrating a birthday: fond memories are shared, funny stories are remembered, and there is a lot of laughing about the good traits of the family member. And with a birthday, there comes a party! The festival in it’s entirety is to laugh at death in it’s face. Death is a natural part of life, it is nature itself – Día de los Muertos is a chance to stave off fear of death which is experienced by many, especially by the Western population, and accept it. There is a lot of preparation for Día de los Muertos, as people who celebrate it are focused on welcoming their family members back in the most spectacular and special of ways. They are waiting for them after all! It is a very expensive time for a lot of families but the festivities and sense of togetherness makes it all worth it. Families build altars (called ofrendas) to welcome their families home from the other side, they clean tombs and tombstones, lay gifts and gather beautiful flowers to set on the ofrendas. It was believed that the goddess Mictecacihuatl’s only weakness was flowers and particularly the Mexican marigold known in Spanish as the flor de muertos. The flor de muertos is a beautiful, bright yellow colour and, as it was Mictecacihuatl’s favourite, Aztecs believed that it’s scent would wake the souls of the dead. The ofrendas built are put up in family homes and are often very elaborate: covered in los flores de muertos, candles, pictures, music, messages of love, sugar skulls, and food that the family member loved. This is often to represent life and abundance. 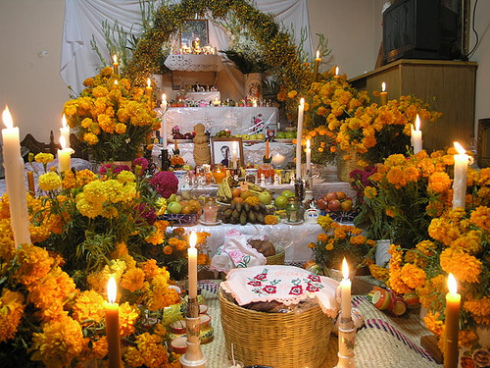 Many believe that an ofrenda covered in the spirit’s favourite things then it will welcome happy spirits who will bring protection, good luck, and wisdom to the living. Building an ofrenda helps to bring the family together and keep tradition alive. However, it is in the cemetery that festivities truly begin. Live music, card games, and the gathering of reminiscing family members make for a wonderful time! The sugar skull is probably the most famous of Día de los Muertos symbols. Sugar calaveras (skulls) and calacas (skeletons) date back to the 18th Century, brought to the ‘New World’ by Italian Catholic immigrants from Palermo. While the sugar plant isn’t native to Mexico, there was a lot of it across the nation and it was cheap which made it an ideal way to make the festival more elaborate and decorative. In the Mexican region of Toluca, a festival named Feria del Alfeñique is held in mid-October leading into La Día de los Muertos. La Feria celebrates the artistry of the sugar models and hosts competitions to champion the best skull. People mould more than just skulls and skeletons too: animals and crosses are just two of many popular models. Many mould accessories for the calaveras y calacas like coffins and different outfits. Calaveras and calacas in general are also very famous. Calaveras and calacas are depicted in everything during La Día de los Muertos, such as pictures, models, costumes and food. Models of these skeletons are often in a variety of positions and costumes themselves but they are usually in fun positions. 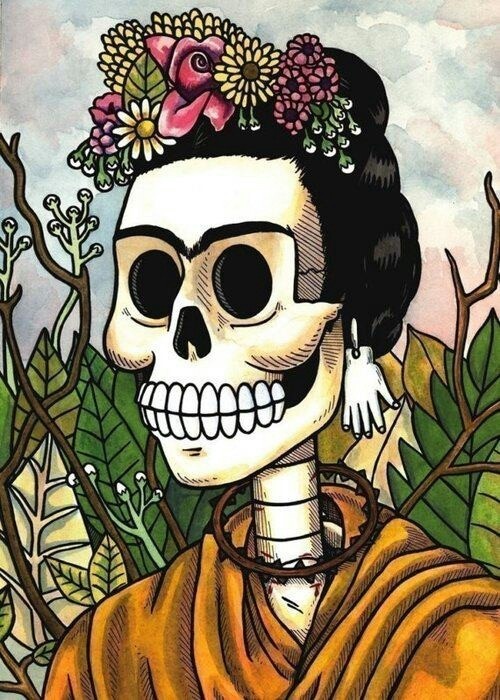 Many important figures from Latin American culture are depicted in calaca drawings such as Frida Kahlo and La Calavera Catrina. Calaveras are usually portrayed in a very distinctive manner. They are drawn in the styling of José Guadalupe Posada, a political illustrator who died in 1913. Posada drew La Calavera Catrina around the year of 1910, which in English roughly means the Elegant Skull. The drawing depicts an old skeletal woman wearing a fancy, expensive looking hat. Posada intended her to be a social commentary on upper-class Mexico and vanity. 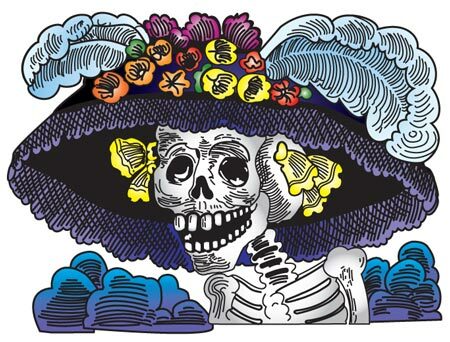 La Catrina is a reminder that no matter how much money someone has, or how pretty their clothes are, they will all die. 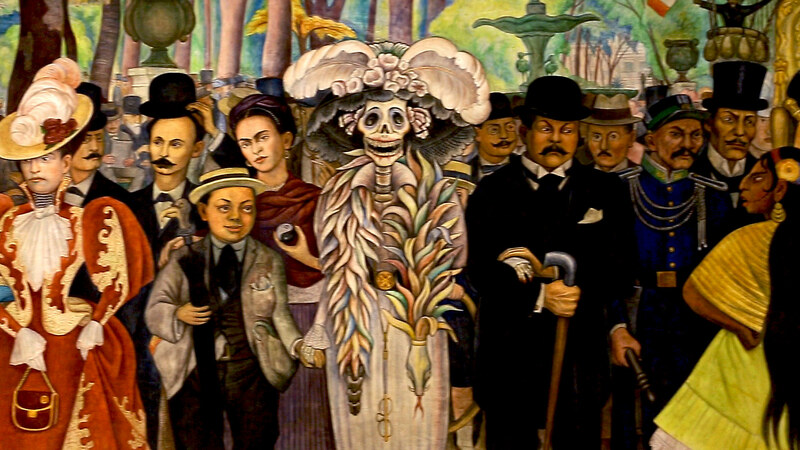 Her image was also used by Diego Rivera in his piece Sueño de una Tarde Dominical en la Alameda (Dream of a Sunday afternoon along Alameda Central Park), giving light to the political commentary intended by Posada. Now, she has come to be an important figure of Mexican national identity, reminding Latin America of it’s diverse and fruitful cultural dialogue. The famous skull is also a result of the impact of the skeleton deity, Mictecacihuatl. The Goddess of the Underworld is depicted as a skeleton in most modern images and her image combined with La Catrina are the two leading inspirations for the makeup seen at festivals (and Instagram) today. Half-painted faces are seen often at Día de los Muertos festivals which represent the fact that no matter how beautiful and full of life you are, the cycle of life will hit you and you will die. Isn’t that cheerful!